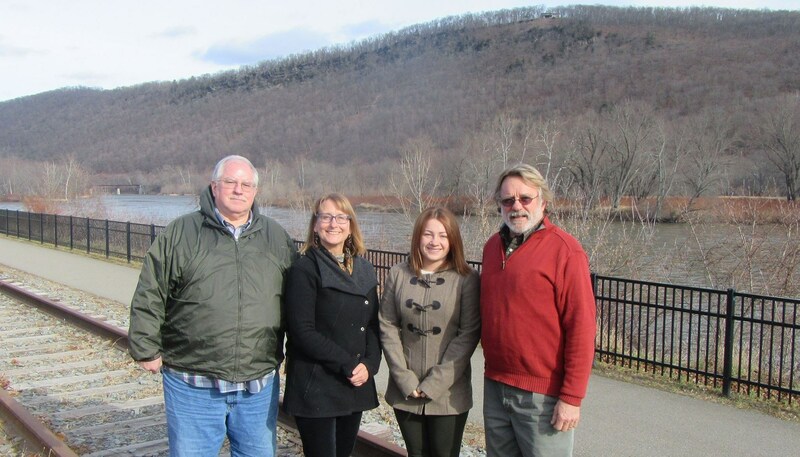 Staff members of the Endless Mountains Heritage Region, including (above, from left) fiscal coordinator David Hindman, executive director Annette Schultz, program coordinator Hillary Robinson, and greenway coordinator David Buck, met at EMHR headquarters in Towanda recently to discuss new benefits for Associate Members and Sponsors in the coming year. The Endless Mountains Heritage Alliance (EMHA) is conducting its annual membership drive and providing a variety of options for support and involvement. 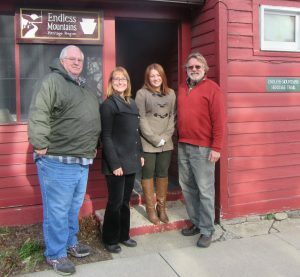 EMHA, the organization that manages the Endless Mountains Heritage Region (EMHR), has been protecting and enhancing historic, natural and recreational assets to revitalize communities in Bradford, Sullivan, Susquehanna, and Wyoming counties since 1988. Associate members receive advance notice of all EMHA-sponsored activities such as Farm-to-Table events, Susquehanna River sojourns, special presentations and Heritage Region workshops on topics such as grant writing, which is new this year. Via periodic newsletters, email links to breaking news, an invitation to the annual summer picnic, and an opportunity to vote at the annual dinner meeting in October, associate members are afforded unique opportunities to stay in touch with the organization without a substantial investment of time. In the coming months, EMHA board members will hold brain-storming sessions in their respective counties to which associate members will be invited to share their expertise and concerns specific to the counties in which they work and/or reside. Associate members and sponsor representatives are also welcome to sit in on regular board meetings in a non-voting capacity. Individuals who share EMHA’s mission of historical preservation and promotion of heritage sites and events are invited to join, as are members of like-minded organizations and employees of businesses supportive of EMHA’s mission and those that benefit from its successful projects and grant programs. Associate members can pursue a more active role within the EMHR as a member of one of several vital committees that advance EMHA’s agenda. Individual members and sponsor representatives are considered invaluable assets by the EMHA. They offer advice, suggest new contacts and strategies, and volunteer in a variety of capacities – without the need to attend bi-monthly board meetings, which are generally held on the first Wednesday morning of every other month. “The EMHA welcomes with open arms any and all input from community members that will help us fulfill our mission to make the Region a better place to live and visit,” said board president Ed Zygmunt. Within a short time, many associate members find themselves wanting to be more involved in the EMHR after gaining a better perspective of the contributions the EMHA makes to the Region and its potential for further development of heritage resources. Annual memberships begin at $35 for individuals and $50 for family memberships. The cost can be shared with an employer willing to match an individual contribution. Business/Non-Profit memberships Range from $100 for organizations with one to 10 employees to $500 for companies and organizations with 250 or more employees. A complete application, which includes additional options for special donations and endowments can be downloaded from www.endlessmountainsheritage.org. For more information, interested readers may call Schultz at 570-265-1528.